These 8-ingredient Healthy Thumbprint Cookies are so simple and delicious, you’d never know they’re refined sugar free, gluten free, dairy free, and vegan! 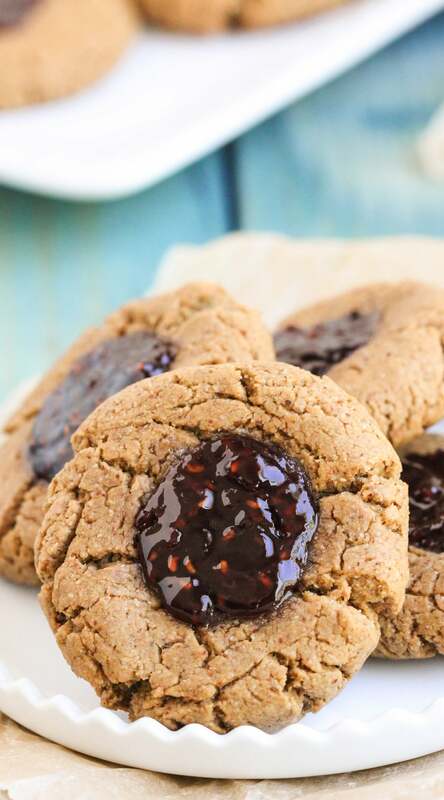 These Healthy Thumbprint Cookies are seriously delicious. 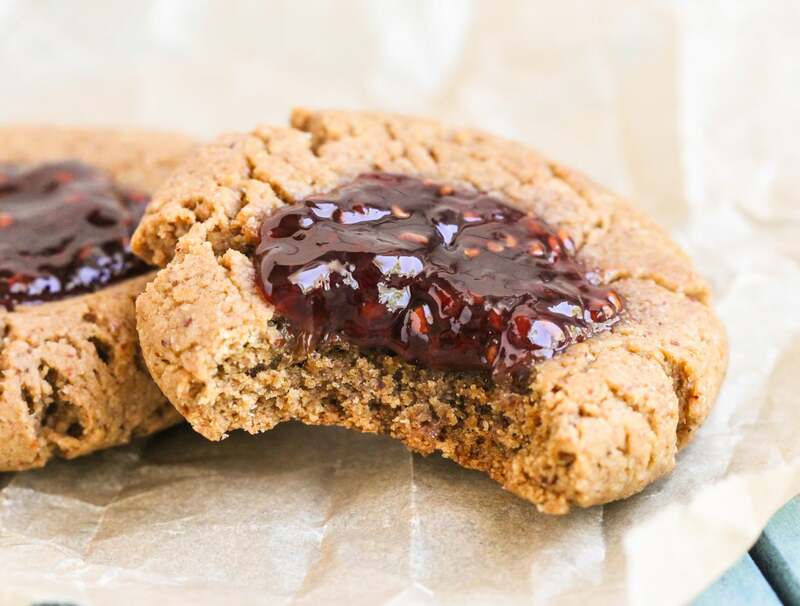 They’re basically soft and chewy almond butter cookies with raspberry fruit spread in the center. Like a PB&J made into an AB&J, and then turned into a cookie. Can these get any better?? No, they can’t. And guess what? These are so incredibly easy to make, too. They require only eight simple ingredients and take just a few minutes to whip together. 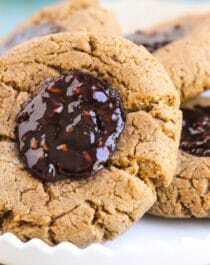 The almond butter makes these cookies rich and buttery, the jam makes them sweet, and their beautiful appearance makes them oh so tempting. No worries, though. These Thumbprint Cookies are good for you! These 8-ingredient Healthy Thumbprint Cookies are so simple and delicious, you'd never know they're refined sugar free, gluten free, dairy free, and vegan! In a large bowl, stir together the almond butter, coconut sugar, almond milk, vanilla extract, and optional stevia extract. In a small bowl, whisk together the oat flour, baking soda, and salt. Dump the dry ingredients into the wet ingredients and fold together. Form the dough into a ball. Break off chunks of the dough and roll into balls. Shape the balls into patties and place them on a baking sheet. Use a teaspoon measure to indent "thumbprints" into the cookies. Reshape any large cracks that form on the edges of the cookie dough. Fill each "well" with some fruit spread. Bake for ~10-11 minutes (do not overbake!). Slide the parchment paper off the pan and onto the counter and let cool completely. Serve and enjoy! These Thumbprint Cookies are soft, chewy, and perfectly sweet! Is it just me or are these cookies just the CUTEST little thangs?? sounds yummy and looks great! OMG. How cute! I needed something to bake for a study-group this Saturday and this is just perfect! Thumbprint cookies were one of my favorites growing up! I found my recipe in an American Girl Doll cookbook. I made them all the time for my family using raspberry jam. We’d eat the entire batch in one day — all 4 dozen cookies! I love thumbprint cookies… there’s something about them that takes out the child in me.. I wish strawberry season were not over here in India!! Awww, they’re adorable! I’ve never had a thumbpront cookie, but this looks like a great recipe to start with. It’s so easy! These look absolutely gorgeous. My DH has been behind my life to make him some jam cookies and these look perfect for that. Don’t have almond butter though…mayb i’ll just go get some from whole foods. OMG! I literally just made these and they are AAAMMMMAAAZING! My new favorite cookie. I used organic blueberry preserves. I’m a cookie lover and it’s very difficult to find good recipes without sugar. You are a life saver!